The basic premise is that in life there are at least two kinds of games: the infinite game and finite games. The purpose of the infinite game is to keep our deepest values in play and invite others in; finite games are the rules, structures, goals and hierarchies by which we organise ourselves. Very often, in the world most of us are familiar with, finite games are competitions – we win or we lose. So what do people most deeply value? Think for a moment. What do you consider precious, special and of value for its own sake? What do you feel makes the world truly alive? Things of infinite value can be in any dimension - emotions, relationships, part of the natural world, objects or qualities. 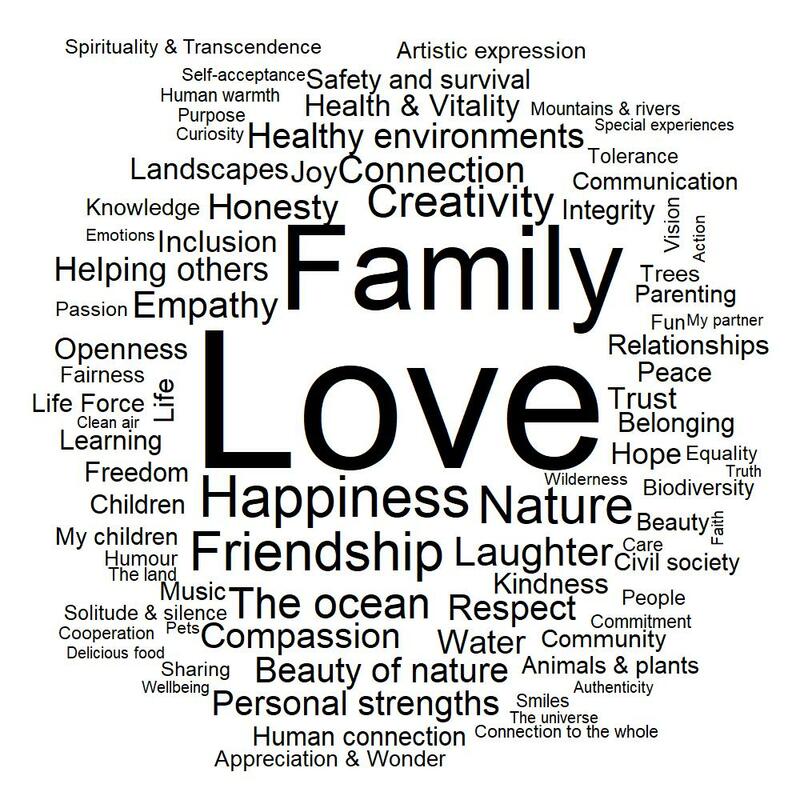 I’ve asked this question of thousands of people in Aotearoa and elsewhere and they consistently name relational and expressive values such as love, compassion, learning, family, friendship, creativity, happiness and the natural world. Here is a word cloud that represents what people name as of infinite value. So if you are playing the infinite game, you are acting to encourage connections between people and with the natural world, human expression and creativity, new life and vitality. It is as simple and as difficult as that! The Infinite Game book outlines 15 principles for infinite play that concern people, setting, knowledge and time. Finite games include laws, road rules, school curriculum, CV templates, building standards and international agreements. Many such games promote infinite values by directing our play toward that which encourages human and ecological flourishing. International agreements on climate change, for example, attempt to set new rules that will protect life on Earth. But sometimes finite games drift away from the infinite game. This often happens when our desire to win gets muddled with the deeper purpose of the game. At the social level we see this in political elections, the free market economy and wars between neighbours. Players of these games may become frantic and ego-bound, wanting to come out on top because that is the marker of success. We’ve got to increase our market share or I will lose my bonus! As spectators we become disoriented and distrusting –why are politicians from opposing parties so extraordinarily rude to each other? Do they really disagree on everything – or are they just trying to score points in a battle for voters? More personal examples of competitive finite games include the wealth required to own a home and the popularity contest that accompanies social media. Two games anyone who works in careers will be familiar with are the competition to gain entry to a professional qualification and the fraught, time consuming game of job seeking. Because winning competitive finite games requires effort, players tend to become focused on the rules of the game. In universities we see this in young people desperate to get into a professional programme, who want to know exactly what is required for an A+. They then do their best to precisely follow the rules – learning for the sake of learning is irrelevant to the win they are seeking. Simultaneously, the winners of today’s game often get to decide the rules of tomorrow’s game - and their impulse, as winners, is usually to keep the rules just as they are. In this way, most finite games are conservative, replicating the status-quo even when it is patently obvious it needs a major overhaul. I mean, if a friendly all-seeing alien was to hover over Earth, do you think they would suggest we continue to play the oil game, pluck fish out of the sea faster than those fish can reproduce, and have large groups of people without much stuff produce tons of stuff for those with far too much already? Well, no. So finite games are necessary, but from an infinite game perspective, they are always on probation. To keep the infinite game in play we need to ask ourselves, what is this or that finite game doing to our lives together on this magnificent planet? Has the time come to adjust it? What new games are available that might serve us better? When our role is to help others find a way through life, it can be useful to direct them towards the infinite values we all share. People almost always want to be part of something bigger and contribute in a way that is meaningful and recognised by others. Although it is possible to create your own finite game – such as a new business, most of us will find our place amongst the finite games currently on offer. But as our insight and confidence grows, we can start to tinker with those games. Small adjustments here and there can invite new players in, take better care of our natural world, and create livelier and more compassionate workplaces. The truth is you are probably an infinite player all ready. The infinite game is something we yearn for as soon as we are born. It’s call vibrates through us in the impulse to be fully alive and share our excitement and wonder with others. We may describe it by another name, lose sight of it from time to time, and wonder if we are the only person who gets it. But don’t worry. Bottom line, we are in this together. If you’d like to find out more about the infinite game or sign up for updates on upcoming workshops and training, click here.